How to ID this stuff? Re-publish old and new data as RDF. Phew! Lots to do! But... I really think this ‘bespoke’ approach will in the end be most productive, because we are not talking about hundreds of key collaborators/resources, but only a few tens. This integration is not like launching a new social media platform that has to be scalable and generic. It has an excellent API. Flickr permits all levels of access permission, and so the data ‘integrator’ may need to be accepted as a friend, and sharing permissions set accordingly, to access full-size images. The user should set the default license for all uploaded images in the settings (CC BY-SA is generally recommended for biodiversity data, the ‘NC’ can be added if that is a concern). 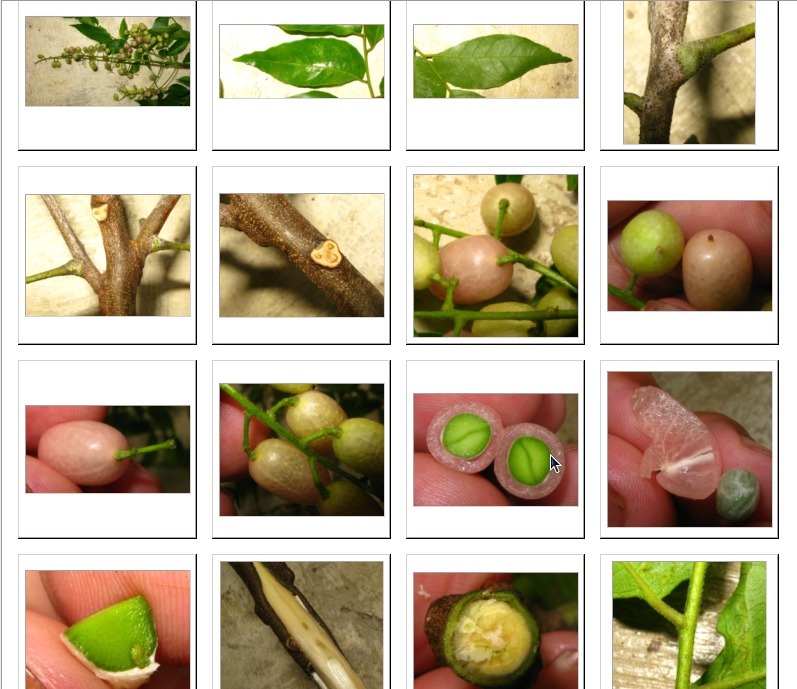 For organizing the images, each album should hold images from a single plant in the field. Thus, the album (e.g., this one: https://www.flickr.com/photos/loupok/sets/72157642193981464/) is a virtual representation of a plant, complete with a permanent URI: it represents a digital collection object, from which (multiple) determinations can be made. These determinations can be offered by another users in the comments section. Albums can be assembled into collections, e.g., by taxonomic family, or by plot or place. Metadata can be deduced automatically, or added as text in either the album’s title or description fields. If any photo is georeferenced in an album, that long/lat can be taken to be the location of the plant. The date of the ‘digital collection’ can be taken to be the time-stamp in the photos’ EXIF data. Note that it is important the users set their cameras correctly! As a default, we can assume that the images were taken by the Flickr user, and that the determination was also made by the same user, unless otherwise indicated in the album’s description field. The album can be titled in any way that the user desires, but it is common to name the album to be the same as the user’s taxonomic determination (see above example). 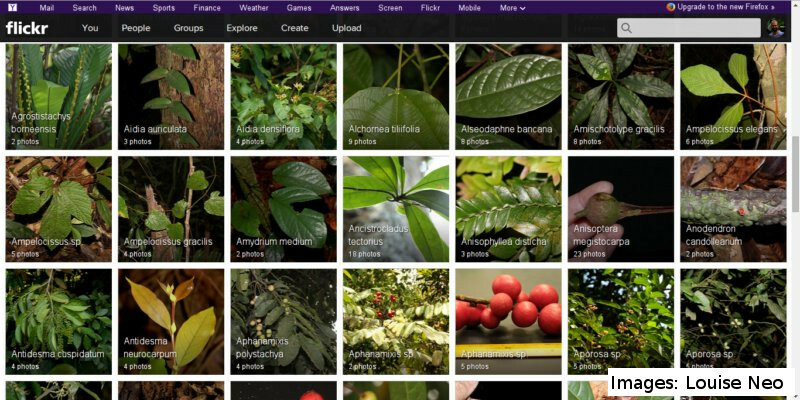 Different albums can have the same name, so several plants can be identified to the same taxon. For a more useful and standardized method of giving determinations, a text string of the form tpl:kew-2607792 can be added in the album’s description field; this gives an unambiguous, machine linkable determination to a name from The Plant List. I’m a big proponent of the need to explicitly give a confidence measure when we give a taxonomic match either to another individual plant, or to an external name. For the former I use high | mid | low, and for the latter, s+ | s- | g+ | g- | f+ | f-: high confidence to species, low confidence to species, high confidence to genus, etc...; note that a specific epithet can still be given with a g+, to indicate a very low quality det to a particular specific epithet. A text string can be included in the album’s description field, e.g., confidence="s-". The individual code of the plant, if it exists (e.g., tree tag number, with plot code). Ideally, where data are added in the album’s description field, they are machine parseable, and use an externally referenced ‘key’ (as in key-value pair), where the subject of the key-value pair is assumed to be the individual plant of which this digital collection was made. I.e., using Darwin Core fields where possible. 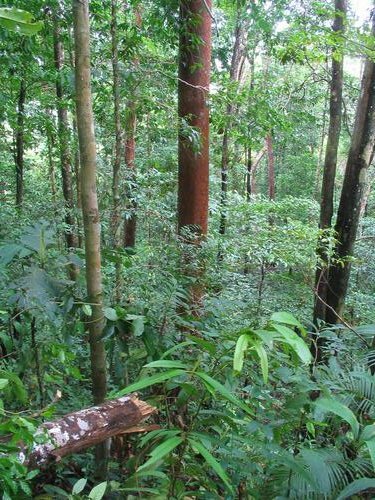 An example might be dwc:island="Borneo" eco:habitat="Freshwater swamp" dsw:toTaxon="tpl:kew-2607792". Note that Flickr tags can also be used, in place of or in addition to the album’s description. Get the direct URL of the image (e.g., method=flickr.photos.getSizes&photo_id=13078067683; try it!). With these calls you can easily and automatically build a database of a user’s images, with metadata. As discussed above, the particular solution for each committed contributor will be unique, allowing for a compromise between their choice of customization (e.g., of metadata codes) and of the ‘integrator’s’ needs, so each contributor script will probably look slightly different. Perhaps a good hybrid solution for many users would be to use Flickr to store the images and then post a simple (flat Darwin Core) CSV file of the associated metadata on a web-page that they can write to. This full set is 21 images for each album. The images should be cropped to highlight the intended part of the plant. Here’s an example from our Xmalesia project database. See Baskauf & Kirchoff 2008 for a more comprehensive discussion of standard views of plants. The community can easily add new determinations (this process partially determines if the record is ‘research grade’ or not). You can easily ‘subscribe’ to a taxon, so that you are notified if new observations are posted to this taxon (and its descendants).